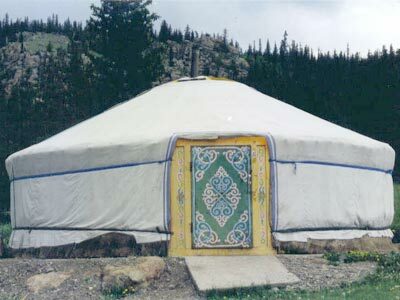 A ger (also called yurt) is a Mongolian tent home. Imagine living in a home that looks like a piece of candy (a Hershey's kiss), but is 9 feet high and 15 feet around! Actually, a ger might look rather odd, but they were very comfortable. Gers are shaped like hollow balls that have been cut in half, with the flat side resting on the ground. Each ger has one doorway, no windows, and a little peak at the top to let the smoke out. Gers were so well constructed that it only took two hours to break down a ger, load it on one or two oxen, and be on your way, off to seek fresh pastures for your cattle. Every ger was set up in the same way. The door always had to face south. To enter the ger, you had to step over the threshold, not step on it. Once inside, furniture had to be arranged in a certain way. When you moved around inside, it was considered back luck to walk counterclockwise. (This belief possibly originated to get everyone moving in the same direction to avoid bumping heads.) Click here to see how a ger was arranged. This style of home is still in use today in Mongolia.